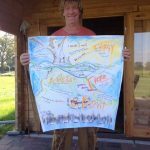 We broke some of the rules of coaching and just started to deeply listen to people tell their stories of their life’s journey to here and draw it. They have touched something in those who have participated. Perhaps people have wanted to be heard, or perhaps they want to hear themselves better! Maybe they want to see or be seen. Whatever it is, something happens. THE SOUL PORTRAITS is part of a sort of on-going discovery lab where we continue to uncover the incredible power of deep listening, catching it all in visuals and pausing to look at what results. Unlike the Vision Quest or Creative Leadership Development sessions we do with individuals, the Soul Portraits hold a special place close to our hearts and we only create them under special circumstances. Your Soul Portraits made it possible for me to transform the picture of me running around and the need to act strongly in the doing world, to let my actions in the doing world enable me to do in the being world. You assisted me and made it possible to make some huge steps that at first appear to be nothing, but then show up for what they are – enormous strides. By your presence and drawing, you enabled me to figure it out not in my mind but in my heart and my guts. I just wanted to say an enormous “thank you” for your session today. It came at such a perfect moment in my life and was exactly what I needed and completely transformative! I am not sure I will ever be able to put into words what it did precisely but I know it has been incredibly powerful for me. I came home and slept like a baby afterwards! It was as if my soul was very tired but so content from finally being heard! What a wonderful feeling!!!!! You do such wonderful work inspiring people! I am beginning to understand the importance of my female energy and power because of the amazing women around me, including you!